DuckDuckGo was founded by Gabriel Weinberg on February 29, 2008, in Valley Forge, Pennsylvania. Weinberg is an entrepreneur who previously launched Names Database, a now-defunct social network. Initially self-funded by Weinberg, DuckDuckGo is advertising-supported, but the user has the option to disable ads. The search engine is written in Perl and runs on nginx, FreeBSD, and Linux. DuckDuckGo is built primarily upon search APIs from various vendors. Because of this, TechCrunch characterized the service as a "hybrid" search engine. Weinberg explained the beginnings of the name with respect to the children's game duck, duck, goose. He said of the origin of the name: "Really it just popped in my head one day and I just liked it. It is certainly influenced/derived from duck duck goose, but other than that there is no relation, e.g., a metaphor." DuckDuckGo was featured on TechCrunch's Elevator Pitch Friday in 2008, and it was a finalist in the 2008 BOSS Mashable Challenge. Weinberg's non-ambitious goals make him a particularly odd and dangerous competitor online. He can do almost everything that Google or Bing can't because it could damage their business models, and if users figure out that they like the DuckDuckGo way better, Weinberg could damage the big boys without even really trying. It's asymmetrical digital warfare, and his backers at Union Square Ventures say Google is vulnerable. In March 2019, Google added DuckDuckGo to the default search engine list in Chrome 73. The daily direct search average for April 2019 traffic was 36.5 million. ^ DuckDuckGo Traffic. 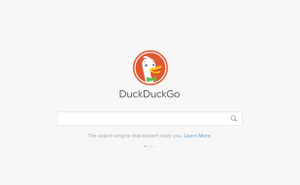 Duckduckgo website, retrieved 23 April 2019.